Gourmand World Cook Book Award 2010 for Best Vegetarian Cuisine Book in India. Saroj Joshi has created approachable and outrageously delicious meatless recipes that will not just please the whole family, but are also a path to a happy belly and a healthy body. 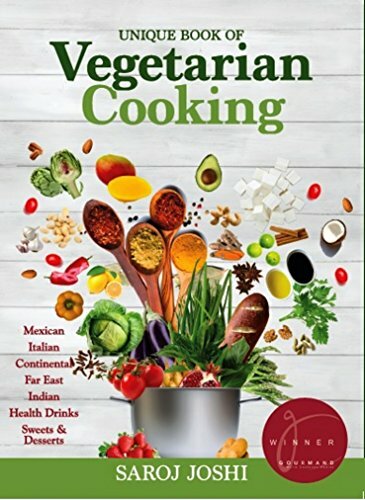 The new and expanded edition of the Gourmand award-winning cookbook features easy to prepare vegetarian recipes covering traditional Indian, Italian, Mexican, Chinese, and Continental cuisines, along with Desserts and Health Drinks. These award winning vegetarian recipes are destined to become new family favourites. Since the invention of hearths and earthen ovens over 250,000 years ago, humans have taken an earnest interest in cooking. Cooking has grown from the simple task of heating raw foods to a science and an art form. As the world grows smaller, thanks to fast transport and improvements in food storage technology, we can now enjoy the freshest produce from the farthest reaches of the planet in the comfort of our own homes. 'Unique Book of Vegetarian Cooking' contains over 100 vegetarian recipes from all over the world. The recipes cover the ancient land of China, the lush green countryside of Tuscany, Italy, the spice of Mexico and the breadth of India’s rich and varied culinary culture. The book covers old classics and new favourites such as Tacos, Eggplant Parmesan, Manchurian, Undhiyu, Goan Curry and healthy drinks. The aim is to allow both seasoned cooks and new students, whether in a fully stocked Indian kitchen or an American kitchen, to enjoy the rich flavours from all over via easy to follow, tried and tested recipes. Saroj Joshi's A Unique Book of Vegetarian Cooking is now available at Crossword. Over 100 recipes including Mexican, Italian, Chinese, Japanese, Goanese, Parsi, Punjabi, Mughalai, Diet Smoothies, Spinach recipes and Health drinks. In 2010, Saroj Joshi released the ‘Unique Book of Vegetarian Cooking’ with her take on recipes from al over the world. The book was launched through a multi-city book launch tour at Crossword flagship stores in Mumbai, Bangalore, Baroda and Pune. The book has won the prestigious Gourmand World Cook Book Award 2010 for Best Vegetarian Cuisine Book in India. The book received positive coverage from newspapers such as The Hindu, Mid-Day, Indian Express, and other local papers nationwide. In 2017, Crossword Book Stores published and launched an updated 2nd edition of ‘Unique Book of Vegetarian Cooking’ book with new recipes, it is available now in-stores and online as an ebook from Amazon. Authentic cookbook in Gujarati of vegetarian recipes covering Chinese, Italian, Thai, Mexican, Continental, Japanese, Punjabi, and Gujarati recipes. It includes a special section of Palak (Spinach) based recipes and health drinks. Due to popular demand, the 2nd edition of the book is out now. Available at fine bookstores across India. Vegetarian recipes made using palak (spinach) as one of the main ingredients. From health drinks to palak paneer, this book covers it all. After numerous requests to share her recipes in printed form, Saroj Joshi compiled a book of palak (spinach) based recipes from her large recipe library. The book covers cuisines from all over the world. Launched by the renowned world famous R.K. Laxman in Mumbai, Palak Preparations was a super hit and sold out quickly. © Saroj Joshi. All rights reserved.